Yesterday we briefly wrote about the D23 Expo announcements in our Question of the Week post. Today, I’m going to dive a little deeper into the announcements with more of my reaction. It was a busy weekend, with Disney announcing more than they ever had at an expo. As I mentioned before the expo, it was time (maybe past time) for some announcements specifically those involving Hollywood Studios. I think Disney realized this as well and offered a decent amount of information about what’s to come over the next five years. One thing I think people forget after the Expo is that Disney isn’t done with their future plans. I believe they announce what the public demands and then holds on to pieces of news that they can announce over the next year. If you simply look at the math at Hollywood Studios attractions, in which they announced 4 attractions and have 5 open to begin with. A few of those existing attractions may close. That still isn’t enough for guests to do for a full day. I believe there is more Pixar coming, as Jim Hill mentioned on the latest Disney Dish podcast. The low point of all of these announcements may be that they didn’t come with expected opening dates. It makes sense why Disney wouldn’t announce those, as plans change and issues come up but it would be nice to know when they expected to start construction at the very least. Let’s dive into specific announcements and I’ll add my thoughts. The Disney Parks Blog announcement is linked with each header. All images are via the Disney Parks Blog unless otherwise noted. We might as well start with the big news. 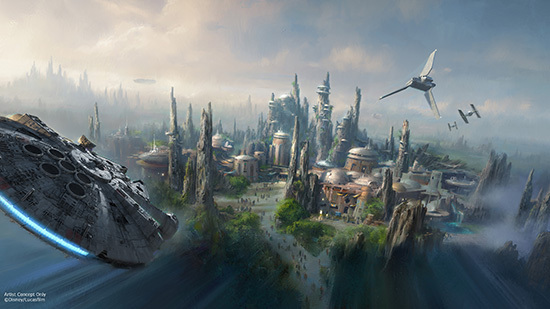 A 14-acre Star Wars expansion was announced for Disneyland and Hollywood Studios. The ambition behind these projects seems to be higher than anything Disney has done in decades. The attraction announcements (check out the press release linked above) is what excites me the most. I thought they would model it after Cars Land with one great E-ticket attraction and then a few other B or C-ticket rides thrown in. Instead, it seems as if they are striving for two E-ticket attractions in one land. Let’s hope that turns into reality. The cantina holds promise, as well. This was the most obvious thing to do in the land and I hope that Disney goes for the level of immersion that we see in recent restaurant projects, like Be Our Guest. If they do, I think this cantina could become the most popular restaurant on property for years to come. I’m happy that they have come up with the back story of this land being a new planet that is a port (of sorts) for ships coming and go throughout the galaxy. I believe it was Disney Tourist Blog that wrote the idea was a no-brainer but I hadn’t thought of it. You all are lucky that I’m not an imagineer. As for the rest of the land, the details were few and far in between. 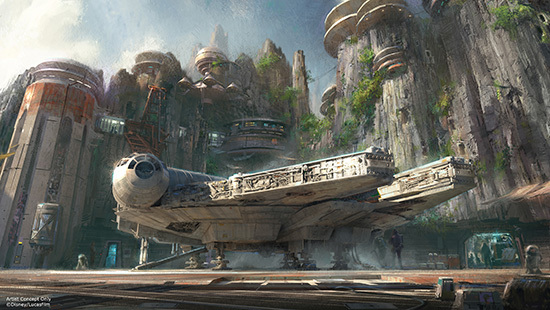 I could see this land opening in phases, starting with the cantina and then moving back to the attractions. All in all, I wouldn’t expect this land to fully open for about 5 years. It could open in Hollywood Studios first, as the building already there would be easier to retheme to a Star Wars motif. There were no announcements on where the land would go in either park. In Hollywood Studios I would imagine that Star Wars would go in place of Echo Lake and extend past where the Indiana Jones Stunt Show currently is. Disneyland is a little more fuzzy on where this land will go. For months MiceChat has said a Star Wars will replace and expand upon the current ToonTown footprint, now it seems that might not be the case. 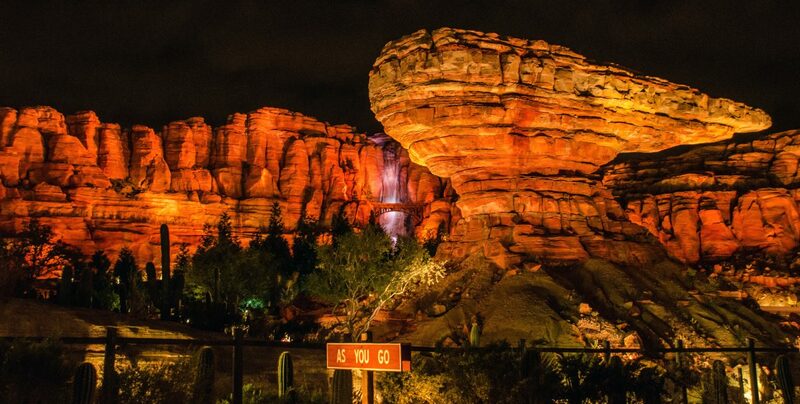 Instead Star Wars would take over the Big Thunder Ranch (#SaveTheGoats) area and maybe a small portion of Critter Country, although it wouldn’t replace any of the big attractions there. While I still think there’s a chance it could replace ToonTown, it would make sense that they don’t get rid of any attractions in the park and instead simply expand. While this land is under construction, there will still be some Star Wars coming to the parks. Star Wars Launch Bay is coming to Innoventions in Disneyland and the Animation Courtyard in Hollywood Studios. This will provide some interactive Star Wars entertainment before and after episode VII comes out in December. There will also be some attraction overlays in Disneyland and a fireworks show in Hollywood Studios, during a special time in the parks called ‘Season of the Force’. That begins in early 2016 and seems like a good idea while people wait for bigger and better things to arrive. My one concern about this Land is how the theme fits in Disneyland. Disneyland has never focused on franchise based themed lands. Having a land based off of a movie is going to take some getting used to. But, if it’s as ambitious as Disney is currently planning on then I think most people, myself most definitely included, will get over that concern easily. 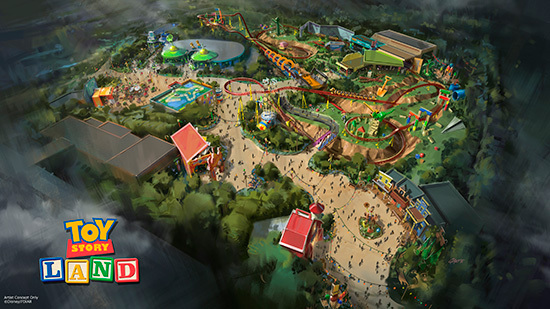 The other big announcement for the parks was Toy Story Land in Hollywood Studios. We have known that an expanded Pixar presence was coming to the parks for a while and it’s not a surprise that there is more Toy Story coming. Toy Story Playland exists in Paris and Hong Kong and consists of off-the-shelf carnival rides themed to a Toy Story feel. This land seems to be a little bit different than its’ predecessors, if you can even call them that. While I love the little green men, the attraction that they are in isn’t very interesting to me. It looks to be just a spinner type attraction, maybe like Mater’s ride in California Adventure. 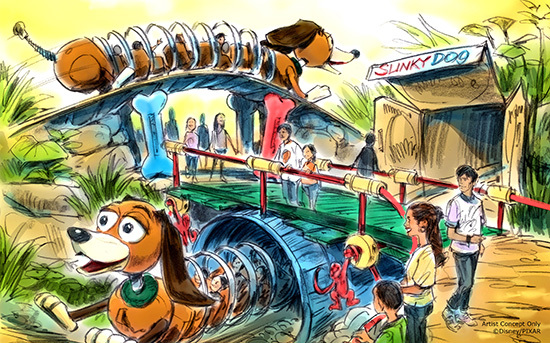 The other attraction announced was a family-friendly roller coaster themed as if you were on the back of Slinky the Dog. Now, family-friendly can mean a ride like the barnstormer or it could mean a ride like the Seven Dwarfs Mine Train. While neither is an E-ticket attraction, there is a noticeable difference in quality between Mine Train and the Barnstormer. I think this coaster will land somewhere in the middle of these two attractions. I don’t think it could possibly be immersive as Mine Train but will also be more interesting than just a basic off-the-cuff roller coaster. These new attractions will surround Toy Story Midway Mania which is expanding and will get a new entrance. As far as theming an entire land to Toy Story and Andy’s Room well… I’m not sure. The concept is interesting but when you think about the themed lands around the theme park world, Harry Potter, Cars, soon-to-be Avatar, the area that they are in is a place that is beautiful or has a level of intrigue to it. Andy’s room doesn’t really have that, unless you are into hanging out in little kid’s rooms. I’m sure the land will look good and have a certain level of immersion but I don’t think it could quite match the quality of the other theme lands I mentioned. I hope I’m wrong. As a land in general, I wish there was a little more to it. The attractions aren’t something I’m all that excited about. I do think it’s necessary to simply add more rides to Hollywood Studios and I’m hopeful that these new attractions will surprise us with unexpected quality. As far as when this land will go be ready, I would guess in 2017 or 2018. These attractions are much easier to build than Star Wars as they don’t take near the imagination as those complex attractions will. The land will most likely take up some of the former Backlot Tour and may end some existing attractions (like Voyage of the Little Mermaid). This leaves plenty of space for more Pixar expansion over the next few years. I believe there is more to come and it will offer better attractions than what Toy Story Land has announced. That’s just my opinion though and, at the very least, I’m glad they are starting to address how there aren’t many attractions for kids or many attractions in general at the Studios. While there was plenty of exciting announcements, a project that’s already been announced, Pandora, stole at least part of the show in my mind. The model that was on the expo floor was absolutely incredible. The greenery around the land looks beautiful and fits in nicely with Animal Kingdom. The imagineers seemed to have taken notice of how Wizarding World of Harry Potter is a land that you have to see twice – once in the daylight and once at night. Pandora seems to be trying for that. As far as the attractions in the land, the E-ticket Soarin’-style ride has promise if it’s not too similar to Soarin’. It sounds as if the ride vehicles in this future attraction are going to make this into more of a thrill than the original Soarin’. That’s good news. I’m really excited to see how the boat ride in this land turns out, as it could really showcase the beautiful plants and lights of the land. I still have more hopes for this land, as well. Some walking paths (maybe some that are hidden) would really continue the exploring theme that the rest of Animal Kingdom has. 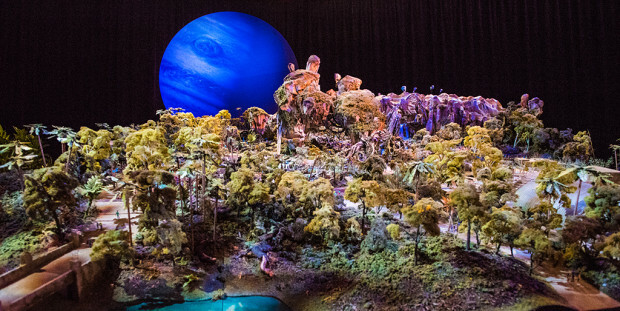 I don’t think they are going to focus on this land being based off of Avatar quite as much as people realize. I believe they want it to stand alone, hence the name Pandora (instead of Avatar Land). My overall thought on all of these announcements was excitement. For a land that has caused much concern among the Disney Fan community, I’m hopeful that Pandora will be a home run. Without a doubt, Disney fans are lucky that Joe Rohde (the imagineer in charge of this project, among many others) takes pride in his work and loves Animal Kingdom like his own child. Avatar will most likely debut in 2017. Anyone who’s read this blog since it began knows that I am an Animal Kingdom advocate. I’ve always been drawn to the beautiful design and exploring nature of the park. This was before anything was recently added to it. Now, I think this park could be the best (probably the 2nd best behind Magic Kingdom) in Walt Disney World and the 3rd best US Disney Theme Park. Rivers of Light, a nighttime show, continues to progress and will be live at Animal Kingdom in the next year (most likely). Joe Rohde said the show will start out softly and grow to a spectacular. I’m excited to see the park progress to a great place to be in the evening. In the same vein, they continue plans to make Kilimanjaro Safaris open in the evening. They will add Wild African Dogs and Hyenas to the attraction at night. Both of Rivers of Light and Kilimanjaro Safaris at night will most likely take open sometime in 2016. I’m very excited for both changes. A new Soarin’ film will make it’s way to the states in 2016. Rumors were that it was going to take a while to come to the U.S. but that obviously isn’t true anymore. I’m very excited for a new Soarin’ film as the original is great but I’m ready for a change. I don’t see how anyone could be upset with this news. I look forward to the new film. Skipper Canteen is a project that was somewhat known but confirmed during the Expo. 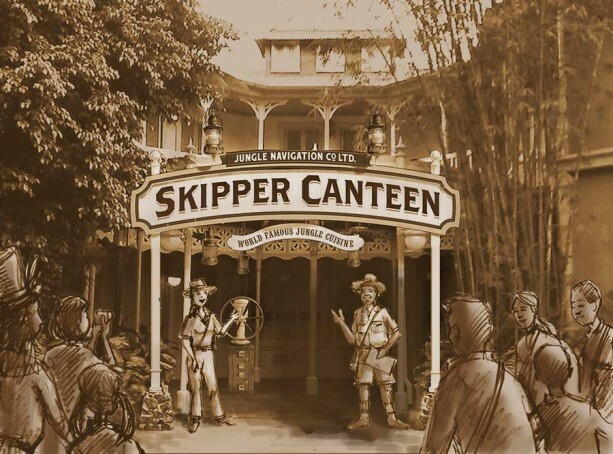 The restaurant will be themed after the Jungle Cruise as a place where the Jungle Cruise’s skippers can go get a bite to eat. I love the concept and I’m looking forward to what the inside looks like. I’m anxious to see if the restaurant serves up a nice blend of nostalgia as well as a fun backstory. I’m also excited and curious to see what kind of food they serve in here. Skipper Canteen will open by the end of this year. 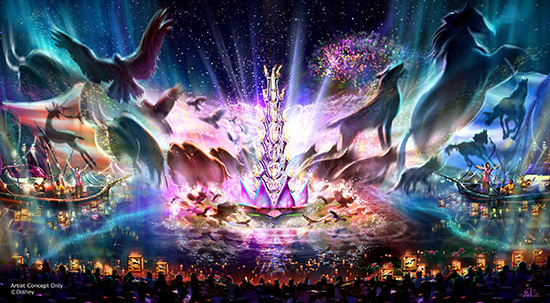 There were some announcements for the foreign parks but I’m not going to get into them now, as I’ve never been to the foreign parks and can’t fairly judge how well they will fit in there. I will say that Shanghai Disneyland is looking more and more intriguing. They also brought up Frozen in Epcot’s World Showcase but there wasn’t anything new mentioned so I can’t add much commentary right now. Overall, I’m excited and pleased about the announcements from this year’s D23 Expo. Both the big and the small announcements are intriguing and I think there are plenty of future announcements still to come. After quite a lull, it’s finally an extremely exciting time to be a Disney fan. Now, I know some of you strongly disagree with some opinions I shared in this post. What are your thoughts on the Parks announcements? Let us know in the comments. Thank you for reading!